30 March 2014, Wellington, FL: The world’s number one rider, Scott Brash (GBR), riding Hello Sanctos, today signed off a highly successful Winter Equestrian Festival with victory in the FTI Consulting Finale Grand Prix presented by Rolex, with Ireland’s Richie Maloney on Slieveanorra in second place and Jessica Springsteen riding Vindicat W from the USA in third. 38 horse and rider partnerships started the first round of the Grand Prix, which was postponed until the Sunday afternoon following a Saturday night of intense wind and heavy rain. Course designer Anthony D’Ambrosio had laid out a big course from the very first fence, and as if that was not enough of a challenge, the time limit of 81 seconds made it especially hard. And to reinforce the challenge he had set, the first three riders into the ring all accumulated time fault penalties by exceeding the limit available. Despite the relaxed feel around the show, the competition was intense within the International Arena and seven went through to the jump-off. Canada’s Ben Asselin was the first to go double clear and set the benchmark time of 46.01 seconds. His time was bettered by Jessica Springsteen after France’s Marie Hecart accumulated eight faults. Richie Maloney was up for the challenge and took 0.17 seconds off Jessica’s time and the target of 44.64 was set. Brash, who despite his huge international success, had never won a Rolex watch before today but had always wanted to win one, had a faultless round and lowered the target time down to 43.44; he then had to sit out and watch as the leading American riders Beezie Madden and Kent Farrington attacked the course. Both were fast, but agonisingly each had the same last fence down, handing the Scotsman victory. 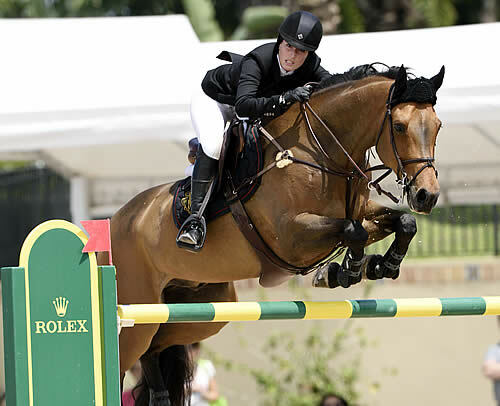 This has been the biggest Winter Equestrian Festival ever, and the Grand Prix competitions have featured 147 riders from 26 countries, including Rolex Testimonees Eric Lamaze, Meredith Michaels-Beerbaum and Rodrigo Pessoa. With total prize money now approaching US$9 million, the Winter Equestrian Festival is the most prestigious circuit in North America. Rolex has enjoyed a successful association with the WEF since 2011, and this is the first year of a new enhanced 10-year partnership, with Rolex becoming the Official Timepiece to both the Winter Equestrian Festival and the Palm Beach International Equestrian Centre. Rolex is a partner to some of the greatest equestrian shows in the world, including the three Majors: CHIO Aachen, the Spruce Meadows Masters and CHI Geneva. These great shows also form the Rolex Grand Slam of Show Jumping which is the first global initiative to reward the outstanding rider who wins the Grand Prix at each show in succession.